As we planned, we did a lot of snowshoeing and XC skiing this week while staying at the cabin. We mainly stuck to local trails in Pike and Arapaho National Forests. There was also one hut trip which will get a separate post. Thought I'd share some beta on our micro adventures for anyone in the area. We've gone to this trail a few times in past winters, but have only completed the 5.5-mile loop twice. There are a few reasons I love this trail (besides the fact I love loops). It offers enough elevation gain and loss to get the heart and adrenaline pumping, but is still beginner friendly. 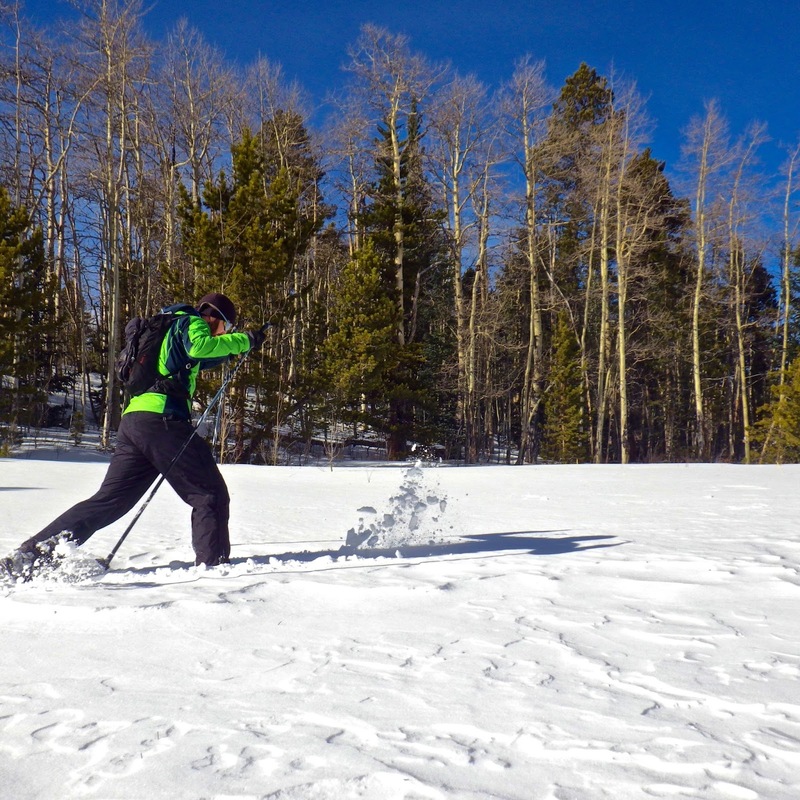 We typically XC ski it for this reason, but you can snowshoe (or even hike it when there's less snow). Another reason I love it is that it is marked by reflective blue markers on the trees. We did spend a half hour route-finding this time around as we were making fresh tracks in the snow, but you just really need to look for the blue markers the whole way. 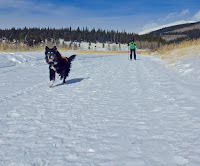 The first mile of the trail is tree-lined with Rocky Mountain ponderosa pine and aspen trees (barren this time of year) with just the slightest of elevation gain (but enough to make the return trip on skis a fast one!). When we are not up for the whole loop, we just go out and back. After the first mile, you hit the loop. We went clockwise this time around. You hit the elevation gain on the loop right away (work hard first), climbing up to views of Sheep Mountain. Then you head out of the forest to a few clearings with views of the Mosquito Range high peaks. The trail follows an old mining road for a bit, as well as a windswept meadow of young timber trees. Once back in the full-grown, thick forest, there is just a little more uphill before you start moving a little faster with downhills. We had to break trail almost the whole loop, which definitely harder work plowing through the snow as if it were cement, but it was fun to see only bobcat, moose and deer tracks! Fun Fact: "Tie hack" refers to workers that used to cut local trees and shape wooden ties for railroad tracks. Each tie was 8.5 feet long! The Bemrose Ski Circus offers a network of trails with 2 trailheads--one at Hoosier Pass and one closer to Breckenridge. You can shuttle cars if you want to go from trailhead to trailhead, but we always start from the Hoosier Pass parking area and there are lots of choices for loops or out and backs. Elevation Gain/Loss: You start at 11,542 feet at Hoosier Pass and pretty much stay at that elevation the whole time, gaining and losing 100 feet the whole time. From here, the Bemrose trails are on the northeast side of the road, across from the parking lot. This particular out-and-back follows the Flume Trail (starting to the immediate left) and follows an ledges to Cornice Creek. Hoosier Pass area is extremely windy, but this section of the Bemrose Ski Circus trail system is tree-covered, with just a few clearings and occasional views of Mt. Lincoln and North Star Mountain to the west. This route is beginner-friendly for a few reasons--the risk for avalanche is low, the trail is mostly marked with blue diamonds and there are only gentle ups and downs (elevation gain/loss of 100 feet). We were breaking trail again the whole time, so there were times the snow was a little deep and more difficult to glide through, but it was still "easy." Some of the other Bemrose Ski Circus trails gain more elevation and are more exposed, so lots of choices! We were joined by our friend, Jason, on this trek! Jason is J's "brother from another mother," literally, they share their Oct. 6 bday! Fun Fact: Europeans use the term "Ski Circus" for alpine areas with a network of trails and ski lifts, sometimes allowing patrons to ski from town to town. The Beaver Creek trails are closest to the cabin. We go there a lot because it is so easy and accessible and there are tons of options, depending on how much time and energy we have. Here are a few options we did this time around. Description: The loop starts at the parking area with a gradual ascent into the trees. At your high point of 10,635 feet, there is a nice clearing with beautiful mountain views. There is even a primitive tree tipi structure that has been there for years. I've always been curious about it. After the clearing, you head back into the forest. At another clearing, there is a nice downhill to meet the 4WD road that follows a flat, wide path back to the parking lot. Description: You follow the old 4WD road the whole way. You can go 3+ miles, but the farthest we've gone is 2 miles on the road. We typically do a 1.6-mile out-and-back, which takes you to a second clearing where trails junction off and there are great views. 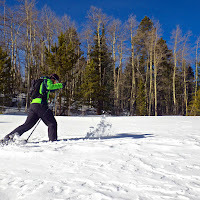 It is just enough ascent where the return trip can be quick on skis.